I went to my favourite LYS, Romni Wools, to return the extra ball I had from my Cherie Amour sweater. Since Romni has a whompin' 2 floors and six thousand(!!!) square feet of yarn, I always wander around the store a fair bit. 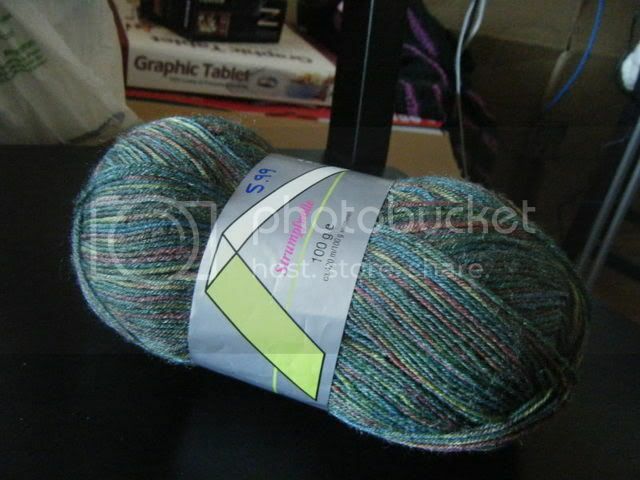 I checked out the sock yarn, and pestered one of the women who works there with my myriad of sock questions. She suggested I use the heavier yarn for the sole of the sock or for the ribbing, and the lighter yarn for the rest of it. Thanks yarn lady! I also picked up some Cascade Fixation in color 3688 (blue-purple), which I've been meaning to try out for quite some time because I have some project ideas. The picture really doesn't do it justice. And it was such a great price! Usually, something like that would go for $10-11, but I got it for $6. Whee! My new sock plan is to make some basic socks out of that Patons stuff, just to get a feel for sock construction, and then make those Monkey socks with the Strumpfwolle. They'll be soooo pretty!